Outside Bangkok Makerspace, Soi 95/1. Conveniently located within walking distance of BTS elevated train station Bang Chak, Bangkok Makerspace offers everything you could hope for if you are in Thailand and tired of being a mere spectator in the maker-movement. Tucked away in a narrow road right off Bangkok's Sukhumwit boulevard, the multistory shophouse has an unassuming exterior, but a very telling interior. A large CNC laser cutter greets visitors on the first floor. Climbing up the stairs, tools are everywhere and rennovation works can be seen underway, as the grand opening is not until February 23, 2014. 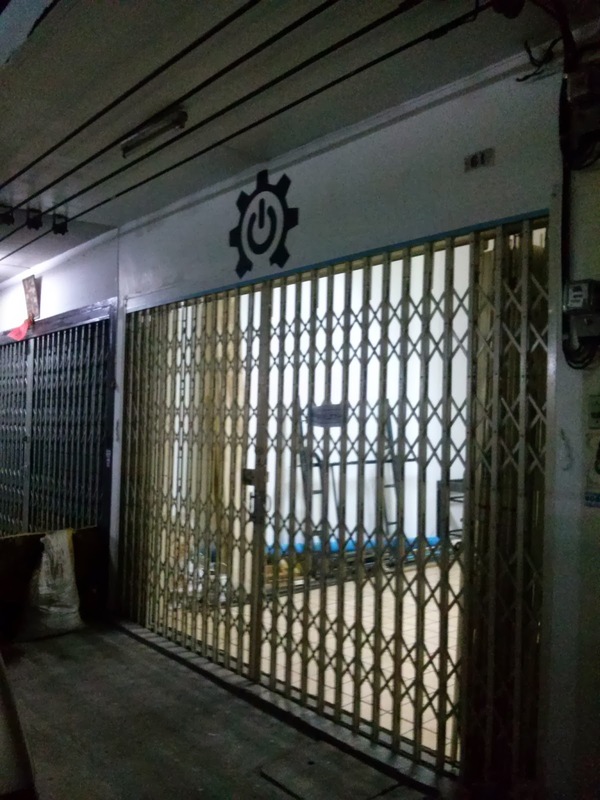 But that doesn't mean nothing is going on at Bangkok Makerspace. Weekly meetups are preceding the grand opening, with topics ranging from everything including drones and arduino, to 3D printing workflows to how to operate the impressive CNC laser cutter. Bangkok Makerspace currently has a page on MeetUp. There are over 100 members so far, and weekly meetings are well attended. Leading the meetup was Jean, who possesses an immense depth of knowledge on all subjects "maker." His presentation regarding 3D printing was impressive -- showing the class the workflow from creating a logo in vector 2D, importing it into SketchUp and making it 3D, then preparing it to print on the makerspace's Ultimaker 3D printer. Jean (left) sets up the Ultimaker 3D printer for 3 demonstration prints during Wednesday's meetup. A visitor who happened to have a 3D model on a thumbdrive was invited to print it out. The model, despite its complexity, came out fairly well and very quickly. Having a place to go and print out 3D designs can benefit educators in many ways, including previously mentioned museum replicas from world-famous collections like the Smithsonian. 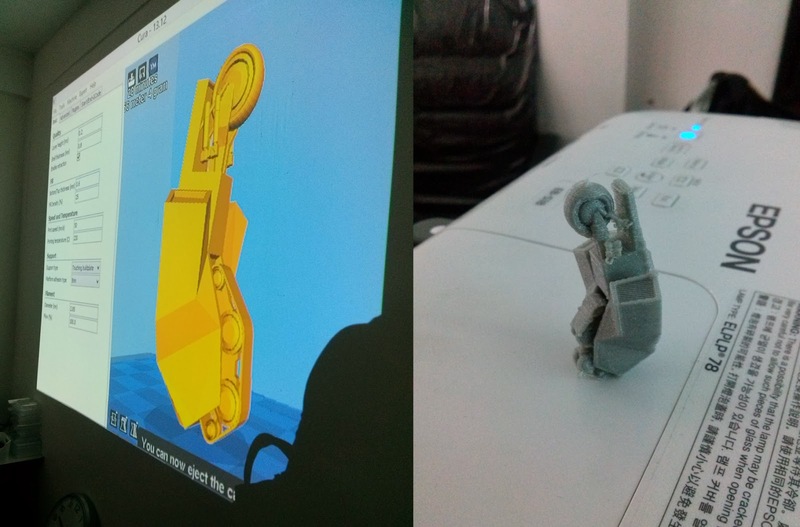 He also invited a visitor to print out a 3D model he just so happened to bring with him on a thumbdrive. Seeing the digital model turned out in plastic before visitors' eyes was an impressive demonstration of the potential of 3D printing and what can be done at a makerspace. The class started around 7pm and discussion went on well into the night with constructive exchanges between visitors covering a lot of ground. For me, on just the first visit, I could already see the potential of not only this particular makerspace, but the positive impact such a community could have across educators, designers, inventors, students, and the curious in general in Bangkok. Jean is definitely blazing a trail others will want to follow, and collaboration between those that do will only expand the potential of makerspaces in Bangkok and beyond. If you're in the area, and would like to visit Bangkok Makerspace -- the gatherings are friendly and informative, the location is easy to get to -- check it out!